Cyrus is a company that refuses to stand still. Its MD, Peter Bartlett, is keenly aware that in hi-fi you need to keep things fresh if you want stay in business. The new 8 XP d integrated is a good example of this approach, it crams in more inputs and features than any previous Cyrus amplifier and most of the competition to boot. Yet it still fits in the half-width casework that is synonymous with the brand. After all, we've seen some densely packed back panels in our time, but in the sockets-per-square-inch-department this takes the biscuit. It's not just about inputs and outputs though, what is really significant about the 8 XP d is what Cyrus has managed to fit inside the casing. The preamp is based on the same circuit topology as the company's £2,000 plus DAC XP and, while it's not fully dual-mono like the XP, it is based on the same concept when it comes to components and layout. The 8 XP d costs £600 more than its vs2 predecessor, but much of the increase can be attributed to the preamp section. The other source of cost is the inclusion of an onboard DAC indicated by the d suffix, something you won't see on the 6 XP integrated, but which is available as an upgrade. The DAC used is a Burr-Brown device, the precise nature of which is not divulged. All that Cyrus will say is that it's the same as you can find in a, "very expensive UK-made music server starting with N." – so no prizes for figuring that one out! However, as anyone who follows such things will be aware, it's not what you've got, it's how you use it that counts and here Cyrus has gone such lengths as including separate toroidal transformers for the signal and control sections of the amplifier, in an effort to keep noise at bay. The DAC takes inputs from RCA coax and Toslink optical S/PDIF inputs, as well as a USB socket on the back panel (the latter makes it the first Cyrus product that's fully compatible with PC sources and allows it to effectively operate as a high-quality soundcard). USB is not the greatest digital audio interface that a PC can offer but it is, as the name suggests, pretty well universal and avoids the cost and complexity of adding an onboard soundcard with a 'proper' digital output. Cyrus makes the point that a PC attached to this amp via USB has greater potential for good sound than a dedicated server, this on the premise that the amp can offer a quieter environment than something which has to combine hard drives with D/A conversion. Cyrus should know as it used to make such a thing... anyone remember the LinkServer? The power amplifier has been upgraded by a new power supply section, in fact the whole amp has a new PSU and this is claimed to be less noisy than previous iterations. It also allows for the amp to have an ecologically sound, sub-one-watt power consumption at standby, so you can leave it on without fearing the wrath of your tree-hugging, eco-warrior neighbours. The huge feature list on the 8 XP d includes the ability to name individual inputs and when you consider that there are eleven in total this is almost essential. You can also adjust the sensitivity of the various inputs by +/- 6dB, so that output level doesn't vary too much when you switch from one to another. Even more clever is the ability to play different sources in different zones, or rooms as we earthlings refer to them, although this does of course require amplification in the remote 'zone' or room. The first system we put this amp into consisted of the Resolution Audio Opus 21 CD player and Guru QM10 speakers, a set-up that suits it rather well because all three elements are very strong on timing. So much so, that for the first time Radiohead's In Rainbows sounded musical and engaging (after a number of less satisfactory encounters using other hardware). This seemed like an auspicious start and confirmed that the 8 XP d is capable of resolving timing cues as well as its forebears, something that the presence of all that processing power could well undermine. Bringing in a more revealing and evenhanded speaker, in the form of Bowers and Wilkins 802D, doesn't seem to phase this compact amplifier either. With only 70 watts to its name and an inevitably limited power supply in physical terms, one might expect it to struggle with this speaker, but the result is hardly embarrassing. Of course, you get more substantial bass with more powerful amps, but the key elements are all there and it is possible to listen at a reasonable level without discomfort. These results were achieved using the amp in analogue mode. Going over to its onboard DAC, the sound is a little bit tighter with some extra treble sparkle and a bit more transparency. It's not clear-cut, however, and which approach works best will depend on the quality of the CD player being used. The Opus 21 doesn't have digital out, so a Bryston BCD-1 was used and it was a close-run thing as to whether the analogue out was superior to the digital feed via the Cyrus' onboard DAC. Concentrated listening reveals that the digital input has a more open and smooth sound, compared to the drive and power of the analogue input. Basically, you hear the Bryston's 'Pro Audio character' when using its output stage and this suits some material and some systems better than others. As Cyrus is so pleased with the preamp on the 8 XP d we put this up against the Bryston BP-16. The dedicated design makes a good case for its price, showing the half-width competitor a clean pair of heels in all departments save for timing, where things are pretty much on a par. We also repeated the Cyrus demonstration from the Bristol show, where visitors were shown what difference a CD transport makes compared to a PC. First we ran a Belkin USB cable from a Macbook, this produces a rather pared-down, but musical enough result and with Bob Dylan and his guitar the lack of detail isn't an issue, it's the musical engagement that counts. Moving to The Chord Company's Optichord optical cable (from the Mac's headphone/digital out) makes a big improvement; in truth it makes the USB sound flat and crude. Girl from the North Country on CD via a coaxial cable (The Chord Company's Signature) made a very good case for dedicated audio hardware – the Cyrus revealing increased dynamics, genuine high-frequency extension and significant increases in detail, which brings a vitality to the music. 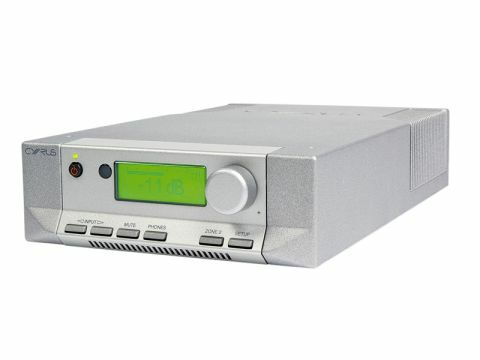 Our final comparison is against one of our favourite integrated amps, the Arcam A38. This is marginally less expensive than the Cyrus, but does not have the luxury of an onboard DAC. Plus the plethora of extra inputs. As an analogue amp, the A38 has a smoother and more assured sound that has greater power, but fails to match the spark of the Cyrus. The 8 XP d is the most ambitious cyrus integrated to date and it does not disappoint, timing is as ever on the button and detail resolution is remarkably good for something with so many features.